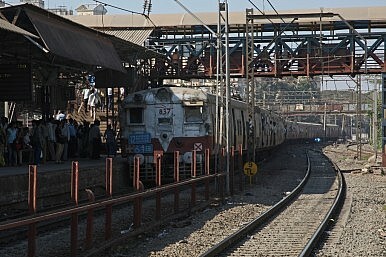 Train station in Mumbai, India. The region’s share of global GDP is low relative to its share of the world’s urban population, a new report says. The World Bank, in a report released today, says that despite progress, South Asia has failed to capitalize on urbanization. Instead of using increasing urbanization as a vehicle to convey prosperity to a greater number of people, the countries of South Asia have “difficulty in dealing with the pressures that increased urban populations put on infrastructure, basic services, land, housing and the environment,” which in turn has fostered “messy and hidden” urbanization. South Asia’s urbanization is “messy and hidden” in that an estimated 130 million South Asians live in informal settlements — i.e. slums and sprawl. Cities in the region, the report notes, have been growing outward rather than skyward, “spilling over their administrative boundaries” and are thus ignored by official statistics that stop at the city limits. In turn, these areas, which have urban characteristics but are not categorized as such by governments, are beyond the reach of many already overburdened urban services. The Economist Intelligence Unit annually ranks cities according to their liveability — looking at five dimensions: stability, healthcare, culture and the environment, education, and infrastructure. Of the 140 cities ranked in the most recent index, New Delhi was the highest ranked South Asian city, at 110, followed by Mumbai at 115, Kathmandu at 125, Colombo at 127, and Karachi at 135. Dhaka landed at 139, only more “liveable” than Damascus, Syria. The report notes that South Asia’s share of the global economy is “strikingly low relative to its share of the world’s population.” With 14 percent of the world’s urban population, South Asia generated only 8 percent of global GDP (for a GDP to urban population ratio of .57). The East Asia and the Pacific region, by contrast, “generated 29 percent of the world’s GDP with a share of the global urban population of 32 percent (a ratio of 0.91).” By this measure, South Asia is closer to Sub-Saharan Africa, which accounts for only 3 percent of the world’s GDP, and 9 percent of its urban population (for a ratio of .34). With a population set to grow by almost 250 million people by 2030, South Asia could be left further behind if it is unable to harness the benefits of urbanization. The report notes, and Indrawati commented in her remarks, that attitudes are changing within South Asia’s governments, with national and local policymakers beginning to move beyond traditional reservations regarding urbanization. The report’s recommendations are wide-ranging, including addressing deficits local governments face with regard to empowering local authorities, finding practical ways to increase available resources, and strengthening accountability mechanisms. South Asia, the report recommends, needs to stop the spread of slums by embarking on land and housing reforms, and foster innovative housing finance initiatives. Yukon Huang, a former World Bank country director for China and currently with the Carnegie Endowment for International Peace, wrote in June that one of the reasons India has fallen behind China in economic development is that its urbanization process has failed. This is not a matter of weak institutions in India — China’s were similarly weak — but productivity gains in India have been lower and housing prices relatively higher. “India’s excessively high property prices reflect a combination of two archaic practices,” Huang says. One is a colonial legacy of reserving large swaths of urban land for government use and sprawling estates, and the other “comes from outdated and overly rigid building codes that discourage concentrated development of commercial activity and housing in the core of its major cities.” Thus the gains of urbanization — many of which come from “agglomeration economies” i.e. having people and business closer together — are lost to slums and sprawl. Investing in resilient infrastructure does not come cheap and funding remains a key constraint.